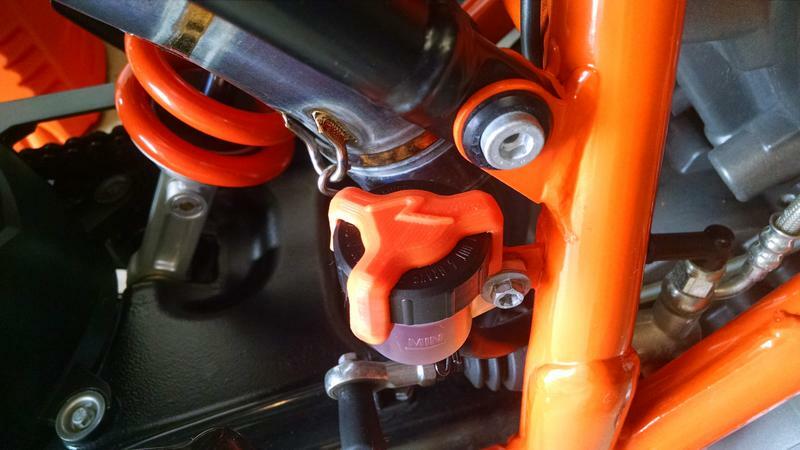 After I got home from a recent ride on the Superduke, I noticed the rear brake reservoir cap and rubber as well as all the fluid were missing. I was lucky that there was just enough fluid in the line that the brake never failed. I did a little reasearch here and noticed that this is fairly common. I think it is probably due to the location of the cap being too close to the right foot. It's very likely that my boot was rubbing on the cap, which could have unscrewed it. I decided instead of relocating the reservoir, I would first try making a cap retainer to lock the cap in place by indexing it to the frame tab. I do a fair amount of 3D printing and design work, so this was a fun project to spend a day on. The retainer is made from ABS plastic and snaps over the cap and holds it in place with the frame tab. So far it works great and is a pretty cool custom add on. I have provided the file for download at a popular 3D printing website called Thingverse. Anyone is welcome to download the file and have their local 3D printing service make a copy for you. I think Kinkos here in the US provides this service, but there should be something in your area as well. If you have your own 3D printer...even better. Make some for your friends. If anyone gives it a try, let me know how it worked out for you. Last edited by motoyoyo on Tue Sep 26, 2017 4:22 pm, edited 1 time in total. Something I did not know I needed. But I do. Now. Thank you sir. I will have a few printed and gift' em to my closest SD buds. Sarasota_Steve wrote: Something I did not know I needed. But I do. Now. I'm inquiring with my geekier friends/coworkers about 3-D printing. If I can get a few printed inexpensively you got it. Seriously. I'll print one when I get home tonight and let you know how it fits. I have some glow in the dark filament I've been wanting to use. Aphex wrote: I'll print one when I get home tonight and let you know how it fits. If it fits and you don't mind glow in the dark (looks off white) then I'll let you guys know how much postage is. I’m in nice cap, how do I Buy one? Last edited by motoyoyo on Mon Apr 08, 2019 5:49 pm, edited 1 time in total.